Danielle Colaprico scores her first goal of 2018. Sandy, Utah — It was the inaugural home game for Utah Royals FC, but Chicago Red Stars midfielder Danielle Colaprico spoiled the party at Rio Tinto Stadium. A near-capacity crowd of 19,203 turned up for Saturday’s game in Utah with the home side in search of their first NWSL win after two draws to start the season. But Colaprico’s first half goal proved the difference and handed Utah Royals FC their first NWSL loss. Colaprico gave the Red Stars the lead in the 27th minute. Alyssa Mautz served a ball into the box in the direction of Yuki Nagasato, playing her first game of the season after missing the first two due to a hamstring strain. Utah Royals FC defender Rachel Corsie won the header, but her clearance went to Colaprico, alone outside the top of the penalty box. Colaprico took a touch to settle the ball before swinging a right-footed volley shot into the upper right hand corner. Utah goalkeeper Abby Smith dove for it, but the ball was too high to get a hand on. Her goal silenced the crowd for a few moments. “Afterwards we realized that the crowd was pretty quiet when we scored. It’s always a good thing when you’re away at a game and the crowd is silent,” Colaprico said. The goal gave the Red Stars their first lead of the season, and eventually their first win — after a 1-1 draw on the road vs. Houston and a 3-2 loss at home to Portland. The loss leaves Utah still in search of their first NWSL win, as well as their second goal of the year. After scoring in the third minute of their opening game, Utah has been shutout for the last 267 minutes. Utah’s offense got a big boost late in Saturday’s game with the return of a key offensive player. Forward Amy Rodriguez entered the game in the 77th minute, her first game since tearing her ACL on April 16, 2017. Rodriguez subbed in to the loudest cheers of the afternoon and was involved in a few late chances as Utah tried to level the match. Rodriguez missed all of 2016 due to the birth of her son, so she had only played in one game over the last two years before Saturday. “It’s bittersweet because of the loss,” Rodriguez told reporters after the game. Rodriguez said she was loosely targeting the home opener for her return, but didn’t know for sure she would play until she was told to start warming up in the 65th minute. Utah’s best chance to even the score came in the 56th minute. Diana Matheson found Gunnhildur Jónsdóttir in behind the defense, forcing Red Stars goalkeeper Alyssa Naeher to make a kick save. The rebound bounced to Brooke Elby, but her shot went wide. 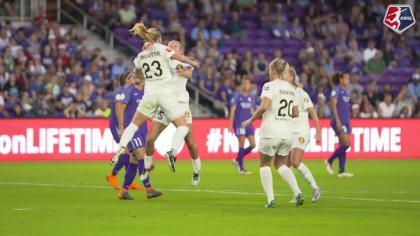 The play was similar to Jane Campbell’s stop on Jónsdóttir in Utah’s Week 2 draw with the Dash, which earned Campbell Save of the Week honors. Chicago had a few chances of their own to add to their lead. In the 22nd minute, Nagasato’s shot beat Smith, but hit the post. Then in the 47th minute, Nagasato’s header on a corner kick was cleared off the line by Utah’s Lo’eau LaBonta. Utah Royals FC will next face the North Carolina Courage on Saturday, April 21, in the NWSL Game of the Week on Lifetime. The Red Stars travel home for a midweek meeting with the Dash on Wednesday, April 18. Match ends, Utah Royals 0, Chicago Red Stars 1. Second Half ends, Utah Royals 0, Chicago Red Stars 1. Offside, Chicago Red Stars. Summer Green tries a through ball, but Stephanie McCaffrey is caught offside. Substitution, Chicago Red Stars. Stephanie McCaffrey replaces Yuki Nagasato. Offside, Utah Royals. Abby Smith tries a through ball, but Erika Tymrak is caught offside. Attempt missed. Desiree Scott (Utah Royals) right footed shot from outside the box is high and wide to the right. Attempt missed. Amy Rodriguez (Utah Royals) left footed shot from outside the box is close, but misses to the right. Assisted by Katie Bowen. Foul by Summer Green (Chicago Red Stars). Substitution, Chicago Red Stars. Summer Green replaces Alyssa Mautz. Substitution, Utah Royals. Amy Rodriguez replaces Diana Matheson. Corner, Chicago Red Stars. Conceded by Sidney Miramontez. Corner, Utah Royals. Conceded by Katie Naughton. Attempt missed. Rachel Corsie (Utah Royals) right footed shot from the right side of the box is close, but misses the top right corner. Assisted by Elise Thorsnes following a set piece situation. Offside, Utah Royals. Erika Tymrak tries a through ball, but Elise Thorsnes is caught offside. Attempt blocked. Erika Tymrak (Utah Royals) right footed shot from the left side of the box is blocked. Attempt missed. Taylor Comeau (Chicago Red Stars) header from the right side of the six yard box is too high. Assisted by Danielle Colaprico with a cross following a corner. Corner, Chicago Red Stars. Conceded by Rachel Corsie. Substitution, Utah Royals. Erika Tymrak replaces Lo'eau LaBonta. Samantha Johnson (Chicago Red Stars) wins a free kick in the defensive half. Foul by Elise Thorsnes (Utah Royals). Attempt missed. Brooke Elby (Utah Royals) left footed shot from the left side of the box is close, but misses to the left. Attempt saved. Gunnhildur Yrsa Jonsdottir (Utah Royals) left footed shot from the centre of the box is saved in the bottom right corner. Assisted by Diana Matheson with a through ball. Attempt missed. Elise Thorsnes (Utah Royals) header from the centre of the box is high and wide to the right. Assisted by Sidney Miramontez with a cross following a set piece situation. Attempt blocked. Arin Gilliland (Chicago Red Stars) right footed shot from outside the box is blocked. Assisted by Danielle Colaprico. Attempt blocked. Michele Vasconcelos (Chicago Red Stars) left footed shot from outside the box is blocked. Assisted by Samantha Johnson. Attempt blocked. Yuki Nagasato (Chicago Red Stars) header from very close range is blocked. Assisted by Sofia Huerta. Attempt blocked. Sofia Huerta (Chicago Red Stars) header from the centre of the box is blocked. Assisted by Danielle Colaprico with a cross. Attempt missed. Gunnhildur Yrsa Jonsdottir (Utah Royals) header from the centre of the box misses to the left. Assisted by Sidney Miramontez with a cross following a set piece situation. Lo'eau LaBonta (Utah Royals) wins a free kick on the right wing. Second Half begins Utah Royals 0, Chicago Red Stars 1. Substitution, Utah Royals. Sidney Miramontez replaces Kelley O'Hara. First Half ends, Utah Royals 0, Chicago Red Stars 1. 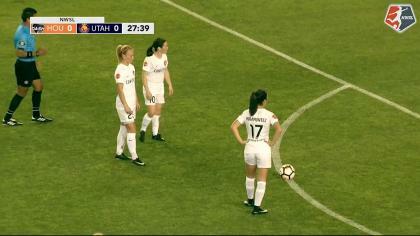 Offside, Utah Royals. Rachel Corsie tries a through ball, but Gunnhildur Yrsa Jonsdottir is caught offside. Hand ball by Brooke Elby (Utah Royals). Elise Thorsnes (Utah Royals) wins a free kick in the defensive half. Attempt missed. Arin Gilliland (Chicago Red Stars) right footed shot from outside the box misses to the left following a set piece situation. Michele Vasconcelos (Chicago Red Stars) wins a free kick on the left wing. Foul by Katie Bowen (Utah Royals). Offside, Utah Royals. Gunnhildur Yrsa Jonsdottir tries a through ball, but Kelley O'Hara is caught offside. Attempt blocked. Brooke Elby (Utah Royals) left footed shot from outside the box is blocked. Assisted by Gunnhildur Yrsa Jonsdottir. Kelley O'Hara (Utah Royals) wins a free kick in the defensive half. Foul by Desiree Scott (Utah Royals). Offside, Utah Royals. Katie Bowen tries a through ball, but Lo'eau LaBonta is caught offside. Attempt missed. Gunnhildur Yrsa Jonsdottir (Utah Royals) header from the centre of the box is just a bit too high. Assisted by Lo'eau LaBonta with a cross following a corner. Corner, Utah Royals. Conceded by Taylor Comeau. Goal! Utah Royals 0, Chicago Red Stars 1. Danielle Colaprico (Chicago Red Stars) right footed shot from outside the box to the top right corner. Offside, Utah Royals. Desiree Scott tries a through ball, but Brooke Elby is caught offside. Yuki Nagasato (Chicago Red Stars) hits the left post with a left footed shot from the centre of the box. Assisted by Danielle Colaprico. Attempt missed. Katie Naughton (Chicago Red Stars) header from the centre of the box is high and wide to the left. Assisted by Danielle Colaprico with a cross following a set piece situation. Arin Gilliland (Chicago Red Stars) wins a free kick on the left wing. Foul by Kelley O'Hara (Utah Royals). Attempt missed. Diana Matheson (Utah Royals) right footed shot from the right side of the box misses to the right. Corner, Chicago Red Stars. Conceded by Becky Sauerbrunn. Attempt missed. Alyssa Mautz (Chicago Red Stars) right footed shot from the right side of the box is too high. Assisted by Sofia Huerta. Attempt blocked. Lo'eau LaBonta (Utah Royals) left footed shot from the left side of the six yard box is blocked. Assisted by Elise Thorsnes with a cross. Attempt missed. Gunnhildur Yrsa Jonsdottir (Utah Royals) header from the centre of the box misses to the right. Assisted by Diana Matheson following a set piece situation. Elise Thorsnes (Utah Royals) wins a free kick on the left wing.